The most awesome and complete features to meet all your needs! 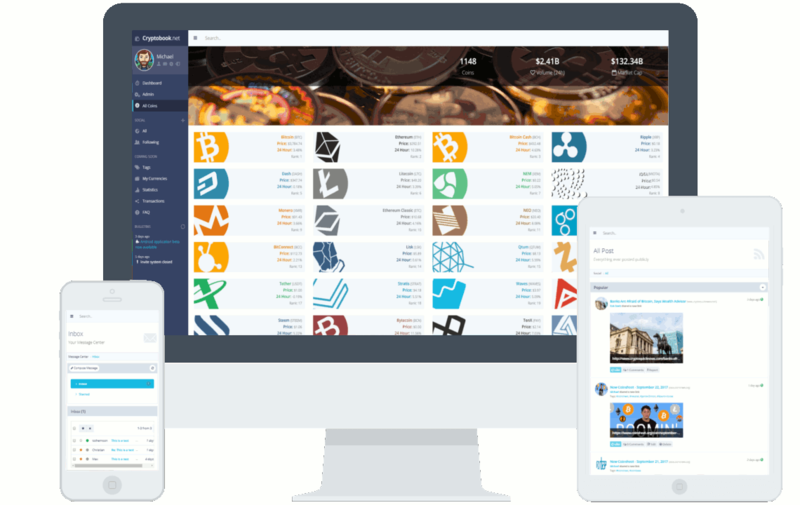 Track all your cryptocurrency earnings and losses on our simple to use platform. We offers a full suite of tools that make it easy to keep up with your trades and purchases, giving you insight into the coins that are profiting you a value, including the ability to see losses due to selling early, and much more! Access to our social features will help you keep up with the latest news giving you insight into what you can expect the market to do and helping you make decisions on weather or not to keep a cryptocurrency your currently holding. Stay connected with other traders and holders using our comments section or inbox system, complete with customizable user profiles! Access Cryptobook.net from anywhere in the world using the mobile version of the site. Built using bootstrap Cryptobook.net will automatically update itself for the best experience depending entire on the screen size of the device you prefer most. Also available is an Android app for more convince (iOS app to be released in the future). Bootstrap is a sleek, intuitive, and powerful mobile first front-end framework for faster and easier web development. Cryptobook.net was built on top, extending it to a large degree. The User Interface will adjust to any screen size in realtime. It will look great on mobile devices and on desktops at the same time. It will look crispy clear on high resolution screens and providing high quality images should your device support them. Cryptobook.net will play nice with all modern browsers such as Chrome, Firefox, Safari, Opera and the latest versions of Internet Explorer. With an easy to use user interface, navigating the site and finding exactly what you need has never been simpler. Built with the smallest screen devices in mind first, then expanded upon for larger devices helps keep everything snappy and responsive no matter the device your using. Cryptobook.net comes packed with so many components. Including things such as Profiles, Social Boards, Private Inbox, Public Profiles, Built in Markdown support, Live Charts and so much more. Create the Dashboard you want for your portfolio in seconds. Complete with drag and drop, so that what is most important to you is right at your fingertips after you log in. Cryptobook.net features 9 carefully chosen and integrated color themes to choose from. Themes apply across the site and to your public profile sharing your color preference to any visitors to your page.